French tosatist; lived in the second half of the twelfth and at the beginning of the thirteenth century. He is mentioned as a prominent Talmudist in "Ha-Terumah" (ed. Zolkiev, No. 44) and in "Roḳeaḥ" (ed. Lemberg, p. 475). 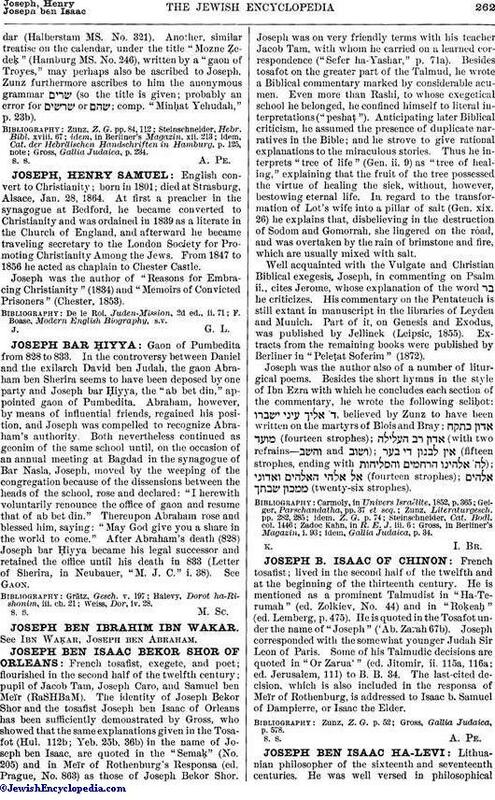 He is quoted in the Tosafot under the name of "Joseph" ('Ab. Zazah 67b). Joseph corresponded with the somewhat younger Judah Sir Leon of Paris. Some of his Talmudic decisions are quoted in "Or Zarua'" (ed. Jitomir, ii. 115a, 116a; ed. Jerusalem, 111) to B. B. 34. The last-cited decision, which is also included in the responsa of Meïr of Rothenburg, is addressed to Isaac b. Samuel of Dampierre, or Isaac the Elder. Gross, Gallia Judaica, p. 578.